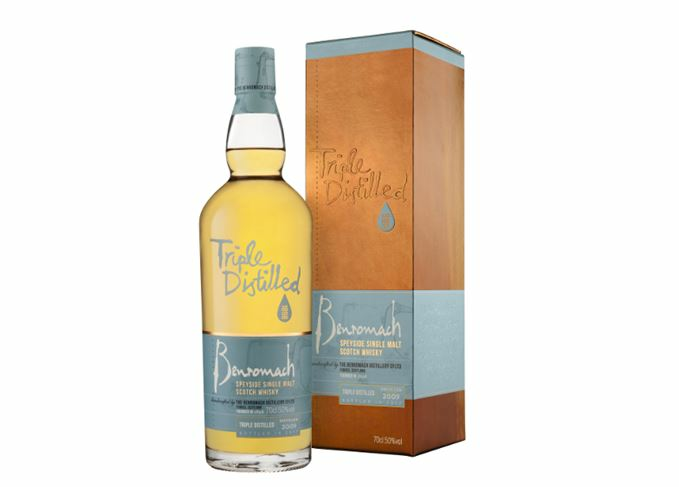 Benromach has unveiled its first triple distilled single malt, joining a select group of Scotch whisky distilleries to use a three-stage process. Benromach Triple Distilled has been distilled once in a wash still, and then twice in a spirit still, before being matured in first-fill Bourbon barrels for eight years. Bottled at 50% abv, the whisky is said to have a ‘light fruity character, with a delicate smokiness’. Triple distillation is a practice used more commonly by Irish whiskey producers, and results in a lighter, ‘smoother’ style of spirit. The majority of Scotch whisky distilleries distil their spirit just twice – once in a wash still, and again in a spirit still. However a handful of Scotch distilleries also distil their spirit three times, such as Auchentoshan, and Springbank for its Hazelburn single malt. Others adopt a ‘partial triple distillation’ process, such as Mortlach and Benrinnes. For Benromach, the decision to create a triple distilled single malt was part of a commitment to exploring new processes. Keith Cruickshank, distillery manager at Benromach, said: ‘The launch marks an exciting time for us here at the distillery as we continue to expand our family of Speyside single malt whiskies. Limited to around 15,000 bottles, Benromach Triple Distilled is available in selected retailers across the UK and Europe, for roughly £44.99. The Speyside distillery is launching a 10-year-old triple-distilled single malt whisky.